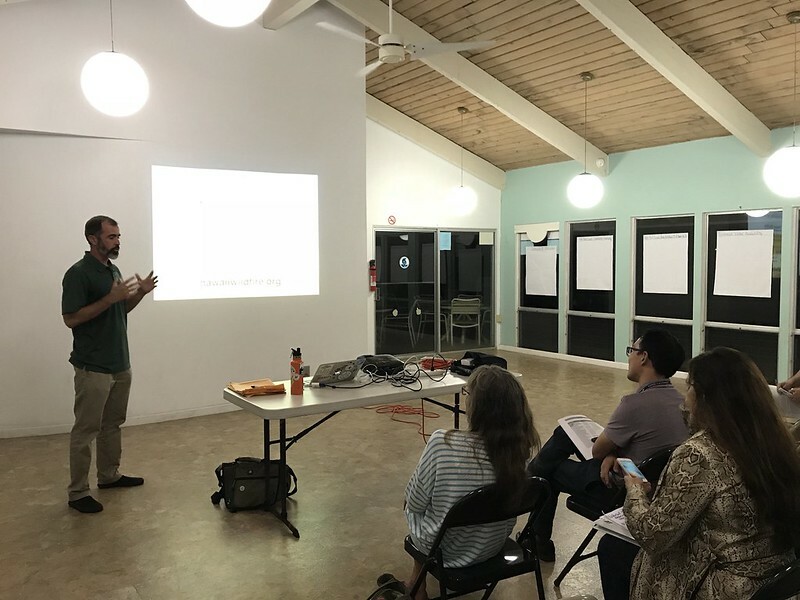 Dr. Clay Trauernicht of UH CTAHR Cooperative Extension and Pacific Fire Exchange encourages the community members in the room to continue to take proactive action in the neighborhood to prevent wildfire loss. On February 13, over a dozen community members from Kamilonui Valley and Mariner's Cove in Hawaii Kai joined our workshop with Honolulu Fire Department, DLNR Division of Forestry and Wildlife, and University of Hawaii CTAHR Cooperative Extension. The community members heard from the various agency representatives about the importance of taking action early to prevent fire loss in the community. HWMO has teamed up with the community to support them in becoming the first Firewise Community in the eastern half of Oahu. As a requirement of becoming a nationally-recognized Firewise Community, our team met with several of the community members a few months ago to conduct a community-wide wildfire hazard assessment. After synthesizing the information in a comprehensive report, we designed a workshop to inform the community members about their wildfire risk. At the end of the workshop, the community members listed the priority actions they wanted to see taken in the community to protect it from wildfire. Those actions will be used to formulate an action plan, another requirement for becoming a Firewise Community. From then on, it is action time! The community plans to take preventive action this summer as part of Wildfire Prep Day with a volunteer event to reduce hazardous vegetation along the edges of the community.